An exciting plan to maximise the potential of Liverpool’s 250-year old South Docks is expected to be endorsed by Liverpool City Council when a new waterspace strategy goes before its committee on 19 November. Working with key stakeholders, the Canal & River Trust appointed international architects BACA to produce an innovative and creative waterspace strategy to unlock the potential of the historic docks. The strategy has been developed as a guide to inform future development of the waterspace within the South Docks.It seeks to transform the docks into a vibrant cultural centre extending from Canning Dock in the north to Brunswick Dock in the south. 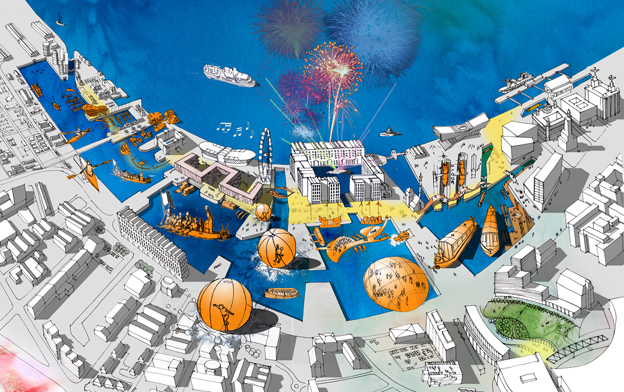 The Culture Zone – Albert and Canning Dockswould be the centre of futureboat festivals, cultural celebrations and even a floating sculpture park Mixed Use Zone – Salthouse Dock could be a floating event space withenhanced public realm and improved interaction between the land and water. Leisure & Aquatic Zone – New opening bridges in Wapping, Queens, Brunswick and Coburg Docks would improve and enhance the existing marina and expand the number of moorings for a wide variety of boats. The Canal & River Trust will continue to work with Liverpool City Council and other partners to develop the dock system into a world class visitor attraction. Liverpool’s 35 hectare waterspace is part of the UNESCO world heritage site and is surrounded by some of the largest collections of Grade I listed buildings in the UK.